Jan 10, 2017: Moronic Monday (Jan 09 2017) - Your weekly questions thread! Jan 16, 2017: Would this portable battery be suitable for the switch. Jan 21, 2017: Which USB battery pack will you be buying? Jan 23, 2017: Best battery bank for Switch? Feb 11, 2017: Best Power Bank for PoGo? Feb 11, 2017: Traveling from US to Iceland, is USB power universal or do I need a converter? Feb 13, 2017: What's in the "go" bag? Mar 03, 2017: PSA: Nintendo Switch uses USB PD (Power Delivery) standard. Buy accordingly. Mar 08, 2017: Portable Charger Recommendations &amp; Testing? Mar 13, 2017: Used an Anker battery as a portable charger while playing BotW on a plane. It works! Apr 06, 2017: Car camping. How to charge phones and other things? May 09, 2017: What is an external battery you recommend? May 15, 2017: Charging new Macbook with Anker Portable Charger? May 18, 2017: Ice should get this battery charger so that the battery lasts the whole day. May 19, 2017: Powerbank isn't good enough? Jun 02, 2017: Is there any consensus on what the all-around best carrying case is? Jun 02, 2017: 500gb upgrade?? Jul 07, 2017: ABGT250-- Power banks allowed into the Gorge? Jul 29, 2017: For a raspberry pi 3 model B, is a 3A battery supply ok? Aug 22, 2017: First Time Goer!Got Some Questions! Sep 09, 2017: Solar trickle charger for car battery? Sep 13, 2017: What tool/accessory should I spend some money on? Sep 30, 2017: Is my Arduino Mega suitable for this project? Oct 12, 2017: Bypass battery DRM by transplanting PCB from officially branded Sony battery. Oct 26, 2017: Is This Powerbank Real or Fake, and How to Test? Nov 25, 2017: Power Station suggestions? Dec 01, 2017: Is there a dash cam that works when the car is turned off? Dec 05, 2017: Any Powerbanks known to work with the TPCast? Dec 19, 2017: Weekly /r/Gadgets Advice Superthread! Dec 19, 2017: TPCast + Rift - arrived! Dec 26, 2017: Which powerbank should I buy? Dec 31, 2017: Battery powered ODroid as LoJack? Jan 21, 2018: Solar charger or battery pack? Feb 04, 2018: No desk? No problem. Feb 10, 2018: Thinking about grabbing a Waterfield switch case and trying to decide which to get? Here's my thoughts. Feb 23, 2018: TPCast: Everything you should know in order to make an informed decision on if it's right for you. Mar 17, 2018: here comes another one! Mar 29, 2018: Are there any good power banks for the Switch that are universal? Apr 05, 2018: Picked up this to help keep my watch charged while traveling. Apr 13, 2018: Is it worth buying a bag with an internal charger? May 21, 2018: Needing a good power brick. Jun 05, 2018: Do I need power converters for camp buhring? Jun 13, 2018: Flying with my Mellohead and need some advice! Sep 12, 2018: My power is estimated to go out for two weeks, please help me. Oct 16, 2018: Anker 3-in-1 USB-C Hub, ONLY $29.99 and More Amazing Discounts! Oct 30, 2018: Will these batteries work with the Wireless Adapter? Nov 21, 2018: Portable battery backup - what do people use? Dec 15, 2018: saving battery life tips? 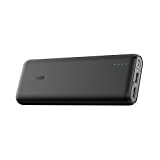 Jan 15, 2019: Best portable charger? Feb 09, 2019: Will this battery work for TPCast? Feb 09, 2019: Powerbank for Dell Inspiron 7000/7386 2-in-1? Feb 11, 2019: Studying during a power outage? Any recommendations? Mar 08, 2019: External battery pack does not power 2018 MBP 15"
Mar 24, 2019: Is it possible to use a portable battery charger while playing the Quest? Apr 09, 2019: External power recommendations, please!